The Collinsville City Commission met Monday July 7th (at the City Hall Community Room, 106 N 12th Street) for a 7pm regular of the Municipal Authority & City Commission. 4. CONSENT: All items listed under the Consent Agenda are deemed to be routine in nature by the governing body and will be approved by one motion of the governing body. Items on the consent agenda will not be discussed. Any member desiring to discuss an item may request that it be removed from the Consent Agenda and placed on the regular agenda. It will then be discussed and considered. A. Approval of disbursements and payroll. * Streetscape within a few day of schedule: July 20th for substantial completion & Aug 20th for final completion. (The asphalt TBA and trees are on separate schedules). 8. 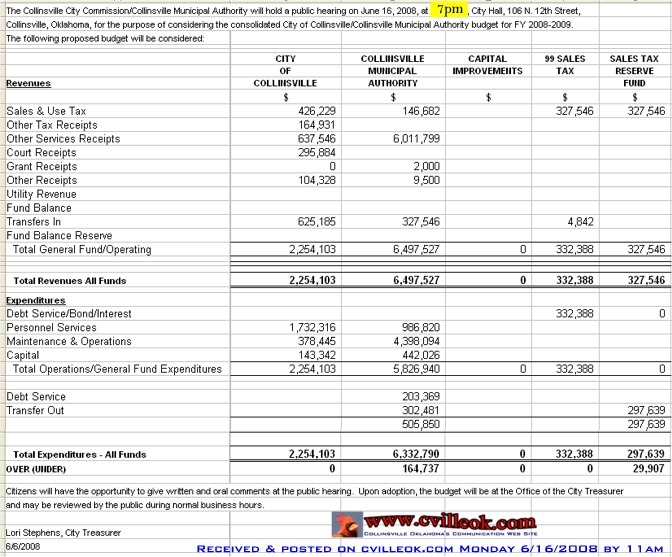 Consideration of any new business, which can be considered an emergency, to come before the Collinsville Municipal Authority not known about or which could not have been reasonably anticipated at the time of posting this agenda. POSTED 7/03/2008 at 6:00 p.m. by Angela Long, City Clerk. 3. CONSENT: All items listed under the Consent Agenda are deemed to be routine in nature by the governing body and will be approved by one motion of the governing body. Items on the consent agenda will not be discussed. Any member desiring to discuss an item may request that it be removed from the Consent Agenda and placed on the regular agenda. It will then be discussed and considered. Fred or Janet Evans, 2 spaces; Linda Fleming, 5 spaces. Main Street Director. -- postponed as Maureen has had an emergency appendectomy over the holiday weekend. Regarding CSP 64, Industrial Building, NE/C of 156th St. N. and the SKO Railroad, IM, 1.97 unplatted parcel. -- the appeal was approved. 7. Discussion, consideration and possible action on appeal from DG&S PropertiesRequesting Supplemental Zoning from RS-3 Single Family Residential District And AG Agriculture District to RS-3/AG/PUD, Residential and Agriculture District/Planned Unit Development (PUD-4) for medium intensity single-family residential Uses; located on 85.89 acres at the SE/C of 129th E. Ave. and 136th St. N. -- This item was postponed to the July 21st agenda with no explanation. 8. Discussion, consideration and possible action of approval of a request for an amended Detail Site Plan approval for a single story commercial office and warehouse facility with associated parking north of the NW/C of N. 9th St. and Broadway. -- approved, based on a compromise from a 5pm meeting the same day by the Appearance committee, where a 10 foot section of the alley side of the building would be bricked. E. Ordinance No. 815 - Ambulance Fees. -- increase approved from $6/mo to $6.50/mo. A. Ordinance No. 811 - Electric Rates. C. Ordinance No. 813 - Cemetery Fees. D. Ordinance No. 814 - Solid Waste Rates. E. Ordinance No. 815 - Ambulance Fees. F. Ordinance No. 817 - License Fee for Dogs and Cats.